In the face of domestic and regional threats, the Kurdish leadership in Iraq has taken the initiative to unite all the political forces of ethnic Kurds in order to make a global solution to the Kurdish question in the four parts of ethnic Kurdistan separated by the national borders of Turkey, Iraq, Syria, and Iran, as well as a consideration of the prospects for the creation of an independent Kurdish state. The Kurds from the four parts of ethnic Kurdistan (Turkey, Iraq, Syria, Iran) supported the idea of holding a Kurdish national conference, whose preparation and conduction has been taken over by M. Barzani, the President of the Kurdish region of Iraq. 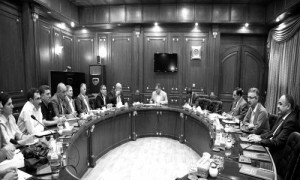 On 22 July 2013 Barzani hosted a meeting of representatives from 39 Kurdish parties and organizations from all four parts of Kurdistan in Erbil. From this a committee of 21 members was created: 6 from Turkish Kurdistan, 5 from Iraqi Kurdistan, 5 from Iranian Kurdistan, 4 from Syrian Kurdistan, and 1 from the National Council of Kurdistan, an umbrella organization composed of the European diaspora, founded by exiled Kurdish politicians, lawyers and public figures. The aim of the Kurdish Conference, scheduled for 15-17 September 2013, includes the establishment of a Kurdish League (following the model of the Arab League), led by the President. Its main task will be to coordinate the development of the political process in all four parts of Kurdistan, enabling a joint effort for the achievement of a global solution to the Kurdish question. Presumably the participants will accept the Charter, which calls on Kurds to cease all quarrels and feuds, as well as a statement about the political unification of the Kurds of ethnic Kurdistan. Two entreaties have been planned as well – one to the peoples of the region and the world, and the other to the Kurdish government. Such aims have been taken somewhat ambivalently by the various ethnic Kurdish organizations of Kurdistan, between which a rivalry for leadership is taking place. For example, between the DPK of Iraq and the PPK of Turkish Kurdistan, who along with the Syrian Kurds are pushing for an open Syrian-Iraqi border. Organizations of Iranian Kurds, who generally don’t cooperate well with each other, may adopt recommendations for a program for gaining rights in Shiite Iran. Meanwhile, the Party of a Free Life of Kurdistan (PJAK), guided by the ideology of Abdullah Öcalan, has announced its readiness to send soldiers to Syrian Kurdistan to protect Kurds from attacks from Islamists. Its functionaries believe that the Kurds must unite in order to fight in the different parts of Kurdistan. They argue that the Syrian Kurds already have their moral and political support. According to them, PJAK fighters are representatives of the National Revolutionary Army, and are prepared to defend national interests. The Union of Muslim Scholars of Kurdistan condemned the activities of a group of young people, far from Islam, which under jihadist pretences shed innocent Kurdish blood. The leader of the Union stated that these “criminal acts” have nothing in common with the principles of Islamic law. They are nothing more than, “the attempts of those who use religion to create chaos and try to discredit the image of Islam.” The organization called on all Muslim clergy members to conduct work with young people in order to prevent fratricidal war. Barzani also believes that Iraqi Kurds could deploy their Peshmerga in order to protect Syrian Kurds from Islamic groups. However, these initiatives are not supported by some influential Kurdish politicians. For example, M. Otman, an independent member of the Kurdish Alliance, believes that the protection of Syrian Kurds is the responsibility of Russia and the United States. As we approach the date of the conference, the various differences between the Kurdish political parties and organizations still linger. At first the organization of the Kurdish opposition in Iraqi Kurdistan refused to participate in the conference, arguing that they do not agree with many of the issues up for discussion. They believe that the dates of the conference, which coincide with elections in the Kurdish Parliament (scheduled for 21 September), were unfairly chosen, benefitting the KDP and the PUK, which also have differing opinions about when the conference should take place. The KDP believes that the conference should always be held in Erbil, chaired by a permanent president of the Kurdish League. The PUK has a different opinion, believing the conference should be held in different cities and its leadership rotated. Some Turkish Kurds believe that Barzani wants to lead the conference in order to diminish the role of the PKK. At the same time, the leader of the Party of the Democratic Unity of Syrian Kurds D. Hanan expressed the controversial opinion that the opening of the Syrian-Iraqi border would eliminate the contradictions between the parties and contribute to the success of the conference. A July 22nd press release from the organizing committee of the conference stated that its main theme would be the question of Kurdish rights to self-determination. The conference will bring together 600 delegates and 300 guests. The quotas for participation were distributed according to the following scheme: 10% – youth organizations, 10% – personalia, 35% – non-governmental organizations, 45 % political parties. Women are to make up 40% of all participants. A representative of the organizing committee said that the conference is aimed at developing a peaceful solution to the Kurdish question in the four parts of ethnic Kurdistan and would not contribute to the outbreak of conflict and war. It was also stressed that Feylis, Yazidis and Alawites are Kurds and will participate in the conference within the delegations from political parties, associations, organizations, or in person. The Kurds of Israel also expressed their desire to participate in the conference, whose numbers there are 500 thousand, adhering to their national traditions. Turkey and Iran followed the preparation of the conference, fearing the adoption of incorrect decisions. Such conferences are expected to be conducted regularly. The first conference is to be chaired by Barzani, the most authoritative and popular politician, holding a pro-Western political orientation. According to some Turkish media outlets, a statement about the future borders of a Kurdish state is being prepared, making up part of divided ethnic Kurdistan, and corresponding to the American plan for the Greater Middle East. This information appeared during the conduction of the peace processes in Turkey between the PKK and the Turkish leadership. According to some analysts, including Russian ones, NATO with the help of the Kurds is committed to putting pressure on Turkey in order to make its management more amenable. Today, the Kurds of ethnic Kurdistan are an emerging nation. Currently, they are unable to overcome many of the ideological and political contradictions at the local and global level. Their prolonged stay in different sociocultural, economic and political conditions and their related systems, connected with the specific division of the ethnic Kurdish state, as well as the uniqueness of the Kurdish national democratic movement in its different parts, are part of the political process associated with trying to achieve national and political cohesion. However, today’s Kurdish elites are seeking to unite the Kurds of ethnic Kurdistan and inspire them to find a worthy place in a globalized world through political and spiritual guidance. Yet the unresolved contradictions between the Kurdish parties in the different parts of ethnic Kurdistan, as well as the complexity of the Kurdish movement in the different parts of ethnic Kurdistan, do not allow one to optimistically consider the prospects of their stated aims. Zhigalina Olga, Doctor of Historical Sciences, Leader in the sphere of Kurdish Studies and Regional Problems, chief researcher at the Centre for Middle East Studies at the Institute of Oriental Studies of the Russian Academy of Sciences, exclusively for the online magazine “New Eastern Outlook”.